Do you link your website to the weather? You should…! Kate Middleton must be hoping that the predictions are right; weather pundits reckon that next Friday will be bright and sunny for the Royal Wedding. Whoopee…! Indeed, almost every bit of media coverage now mentions the weather and the forecasters are being dragged into studios across the world to say if the big day will be dry and bright. We are fascinated by the weather. Our fascination is shown by our search activity too. When it’s bright and sunny outside, guess what? 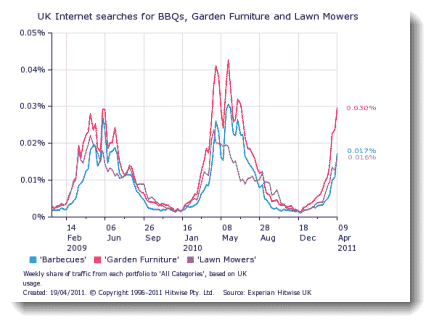 Yes we search like crazy for barbecue advice or want to buy a new lawnmower online. According to recent research from Hitwise, our search activity matches the weather. The traffic for summer things tracks the temperature it seems. Of course, this should come as no surprise. Toyshops are already organising their Christmas campaigns and gritting supplies companies are gearing up for the next big freeze. However, whatever business you are in, much of your activity is predictable – whether it is seasonal, weather-related or because of some association to specific diary dates, your business is linked to the calendar in some way. And that means your website content should follow similar patterns because your potential audience will also be following the cycle of activity. It is no good lawnmower manufacturers now bleating they need content on their website because the sun is shining. They knew that was going to happen a year ago, so they could have the blog posts up their sleeve already. What the cycles of search activity really show is the predictability of the content you need for your website. That means you can plan in advance and get the right content in place ready for those army of searchers when they are triggered by the weather or some other external event to look for what you have on offer. So, how can you achieve the success you need online using cyclical search data? Well, use your own analytics and tools like Google Trends to look for patterns in search activity on your topics. Then plan for producing content in advance of those trends so that the information is available on your site in advance and ready for people when they look for it. And it looks like Kate Middleton has done something similar herself – the 29th April is amongst the driest and sunniest days in April. She found the trend and went for it. You could do the same for your blog or website. I’m going to be in Men’s Health magazine…! Thats a good pointer. I am into house cleaning business and i aggree now that i should link my site to weather website. it will help people to decide when to plan their tenancy cleaning and book our services.